If you've gorged on store-bought cookie dough, with its 40 teaspoons of sugar per log, then you've probably felt the come down that happens on the other side of it. 1 cup cashews, soaked in hot water for 20 minutes. 1/2 teaspoon mesquite or maca powder. 1. Drain cashews from soaking water and rinse. Place into a food processor with remaining ingredients for the Raw Cookie Dough. Blitz until combined. Place mixture in the freezer for 10 minutes so it’s easier to work with. 2. Once the dough has set, roll into 8 balls. Place a paddlepop stick or thick skewer into each ball. 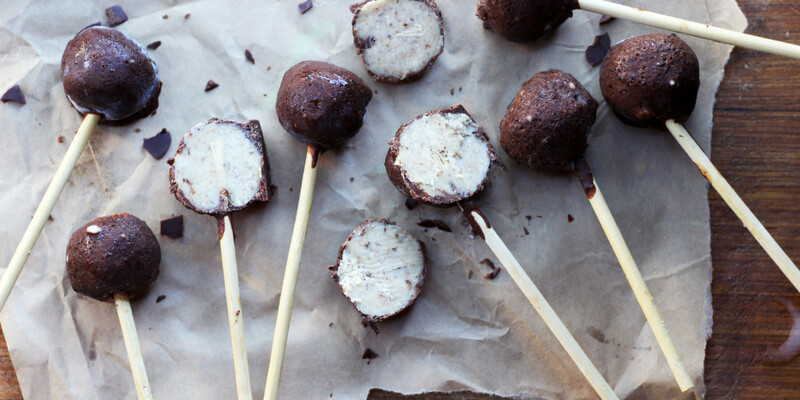 Mould a Raw Cookie Dough ball around each stick. (If you don’t have a stick, these also work well without the sticks as simple balls). 3. To make the Raw Chocolate Coating, whisk all ingredients together in a bowl. Then dip each Raw Cookie Dough Ball into the chocolate. You may like to use a spoon to pour chocolate on the underside. Place onto a lined baking tray or plate. Repeat this with the remaining Raw Cookie Dough Balls. Once done, place back in the freezer for chocolate to set, about 10 minutes. 4. Once set, you may like to do a second layer of chocolate. Repeat the process as above.